kind of upside down. The technique is not sensational in itself, it’s coming from counterpoint, something we will look at soon, as Beethoven uses it later on ( it is deadly cool stuff, counterpoint). To play the motive upside down is called melodic inversion, not a very chocking name since to invert means placing something upside down. To take the first theme and fibble it around to make a second theme out of it is, again, much more in the style of Joseph Haydn than Mozart. 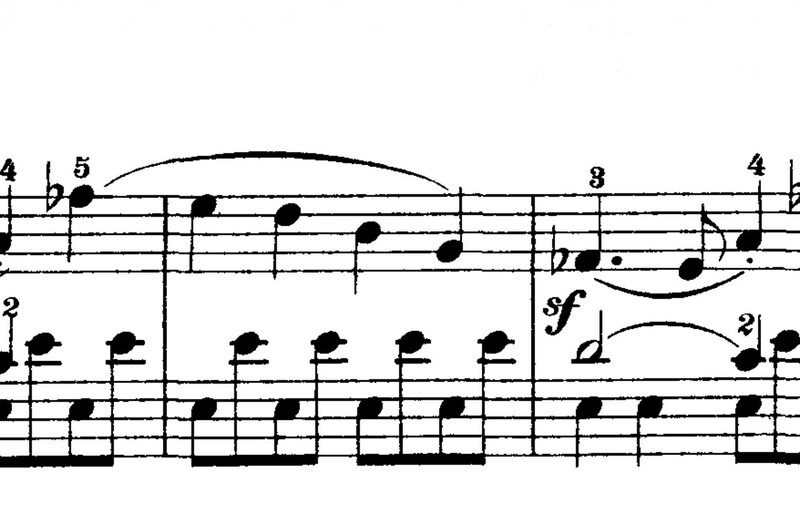 When you play this on the piano of those times (which were generally five octaves in range) the hands would be at the very end of bottom and top of the keyboard at the same time. This is a first sniff of something Beethoven would do to the extreme later on. We have now come to the end of the Exposition, with first theme, second theme and codetta. To continue, one will have to get to know the Sonata form to follow. And that you can do here. What a great idea! To make it sadder. Wow. That’s really a thoughtful idea. Perhaps if the sforzando is not so piercing and abrupt – but within the context now of the ‘piano’ dynamic. Someone said that the key of f minor itself may have been suggested by listening to music of CPE Bach. That Sturm und Drang you talked about. I think this is the part where it enters. It becomes rather frenetic and sad at the same time.